Scottsdale shade structure is popular with a functional 2nd tier for airflow. This popular model is especially efficient with a functional 2nd tier, facilitating a pleasant airflow on those warm summer days. The Scottsdale model is easily dressed up with masonry stonework, multiple columns, and ornamentation. The first photo is of a 25′ x 25′ Scottsdale with cool copper penny 12″ o.c. standing seam roof with traffic white powder coated frame, custom lattice ornamentation and cluster columns at Barker Lake, Houston, TX. Val Vista Lakes, Gilbert, AZ: 20′ x 20′ Scottsdale model with 3 cluster columns, HR-36 steel roof in Marine Green color. Set on a fishing pier. 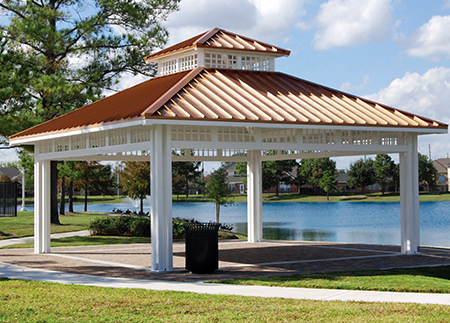 Hurwitz Park, Irving, TX: A beautiful 24′ x 24′ model w/ Tahoe Blue HR-36 steel roof, over 2″ x 6″ tongue & groove subroof. Masonry and stone work by others.